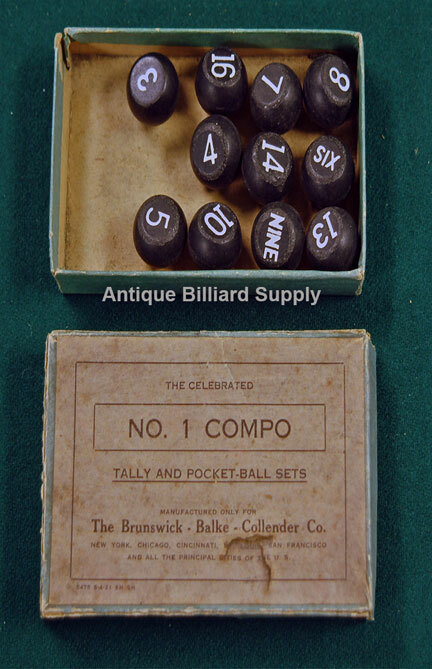 Antique Billiard Supply: Brunswick-Balke-Collender numbered "peas"
#10-12 Rare box of Brunswick-Balke-Collender numbered "peas" for use in a shaker bottle. Only a partial set as shown, but the box is dated 1921 and would make an excellent addition to a display of vintage billiard accessories. © Copyright 2019 Antique Billiard Supply. All Rights Reserved.